Firstly, I'd like to thank all the readers of Mandarin Segments for their support during the year. Blogging is fun, but really connecting with you all has been fantastic! I appreciate the time you take to read my posts, but I especially appreciate the time you take to leave comments, to disagree, and to engage me. 非常感谢! Although I spend a lot of time planning my articles, it's really the comments from readers that enhance the message that I'm trying to share, and that give other readers a wider perspective on the topic. If you subscribe to Mandarin Segments through an RSS reader or through email, you might have the original post delivered to you, but you might not know about the comments that have subsequently been added. The same applies if you just link here from my Twitter account, without seeing any later input. Day 18: 500 characters: but what is hurting? and also: how much of a page can I read? Day 46: 1000 characters - how is my learning? So check out the posts, read the comments, and please feel free to leave more comments. I'd love to hear from you! In the meantime, I wish you all the best for the holiday season - and a fantastic new year. You might not know it, but you deal with dragons everyday. At least, you do if you speak Chinese. This is another in my WordPack series, with this topic having been inspired by a post at the "Those crazy Chinese" blog. The goal of WordPacks is that, by linking these words together by a single theme, it makes it much easier to learn words. And if you're learning Chinese, let's face it, the more help you can get, the better. 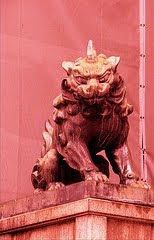 The Simplified character for dragon is 龙 (and it is 龍 in traditional Chinese writing). Even if you're only learning Simplified, this is a good example of a character which you should also learn to recognise in Traditional - because it appears so often in the name of Chinese restaurants. If you're a newbie, you should make sure that you can at least recognise 龙, and that you also remember the word: shuǐ​lóng​tóu. At elementary, at least know the above, plus all food references. At intermediate you probably know all of them. Off you go ... go slay another dragon!